Bort honey is an heirloom craft honey uniquely produced by Polissya honeybees in pristine woodlands of northeastern Ukraine. The bees are hived high up in medieval tree truck hives called “borts” where they are kept chemical treatment free, with minimal intervention by families of beekeepers where the craft was handed down generation to generation. The products of the hive are made strictly by the honeybee workers: the comb is foundationless, the pollen foraged from a diversity of wildflowers, and the propolis from abundant resins of the pine forests. 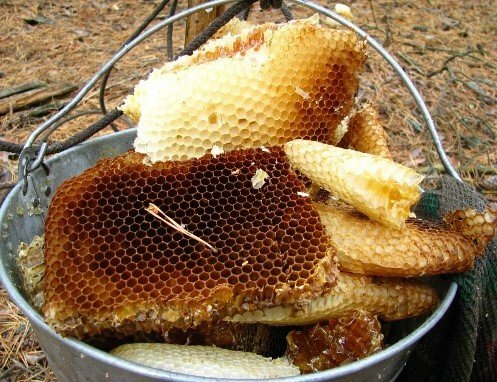 Due to harvesting challenges, these exquisite products of the hive are of a limited and seasonal supply. 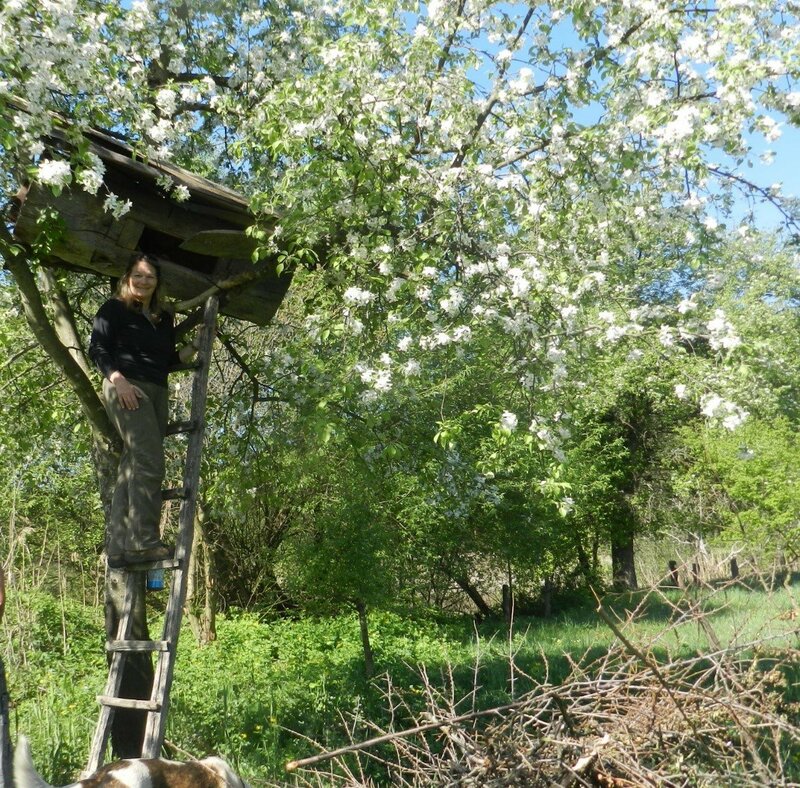 I visited the Polissya Reserve located in the Northwestern corner of Ukraine for the first time way back in 2012 after I found out that it was one of the last places in Ukraine that still practices the ancient style of wild beekeeping called “Bortnytstvo”. Historically, our Ukrainian ancestors were keepers of this primitive method where this subspecies of European black honey bee produced a rich forest honey sourced from pines, oaks, as well as local plants such as buckthorn and heather. 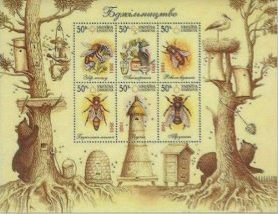 These early beekeepers called “Bortnyky” actively and successfully engaged in extracting the honey of wild bees that lived in real tree hollows. 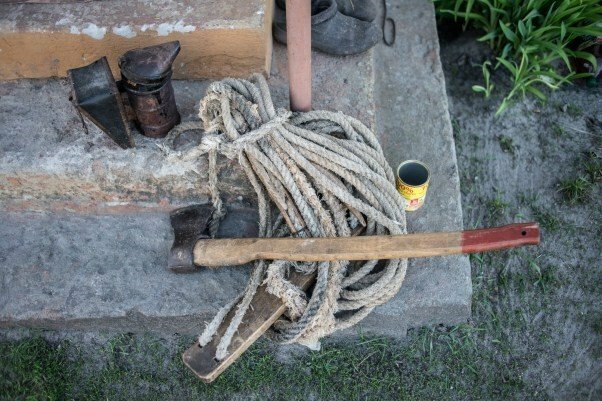 As time progressed and for convenience, these native Polissiyans began to carve man-made artificial hollows and would hoist these trunk hives up hundreds of feet onto living trees. These bort hives have been pictured on the coats of arms of many cities as well as on stamps and coins. 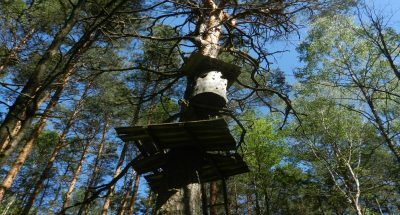 You could spot these authentic hollowed out pines bee hives in the Zhytomyr region of Ukraine. However, many are deserted and are merely for show. This was definitely going to be an adventure!! 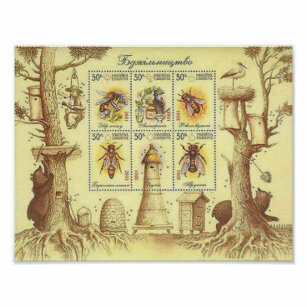 Several times I had to collect the honey from these hives – says Sergij, hanging in the sky on a narrow unsteady plank was not the most pleasant of experiences. 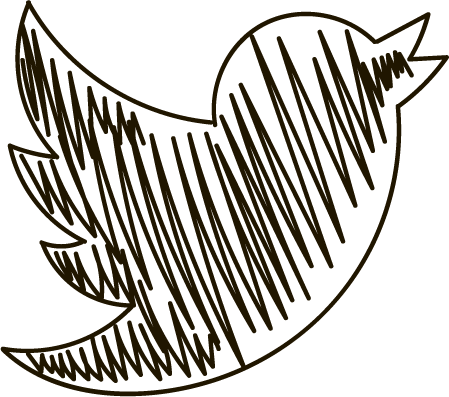 The tree sways in the wind, bees crawl into my eyes and haphazardly sting. Both of my hands are drenched in honey and grandfather’s “statistics” comes to mind about the all too many wild beekeepers who crashed to the ground or were crippled. He continued to tell us about this precious forest honey that is collected from these tree hives but once a year – in early autumn, when the bees are not very active. One bee-tree brings an average of 10-20 kg of honey per year. He told us of how this Wild-hive honey is an invaluable product, because the honeycomb is not separated from the beebread, so they combine the beneficial properties of bee products: beeswax, propolis, pollen and the like. This combination improves human vitality, relieves fatigue, and strengthens the spirit, according to Serhij. Serhij is a true naturalist, teacher and guide and the experience concluded with me getting to climb up to a quiet tree truck hollow in the outskirts of the woodlands. It was here that we first fell in love with the amazing taste, texture and aroma of this precious Polissya Bort Honey. A prize for any hunter of the out of the ordinary! !